Meet your guide and transferred to your hotel. 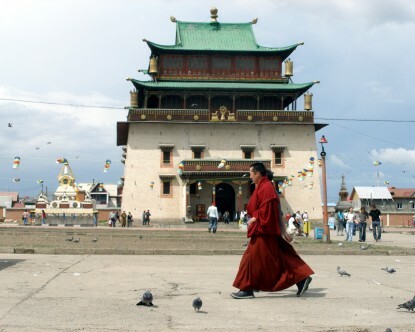 After lunch take a city tour of Ulaanbaatar which includes Sukhbaatar Square and Gandan Monastery. In the evening watch a cultural performance. The real adventure begins today start the drive out of Ulaanbaatar to the middle of the Gobi Desert driving will take about 5 hours today and you will pass beautiful rock formation of Baga Gazryn Chuluu. Tonight will be spent in a wonderful Ger Camp (resort). Continue through the Gobi Desert driving another 6 hours to a Camel Camp. Take part in camel Riding and immerse yourself in the Nomadic lifestyle in Mongolia. Spend the night in your local but luxury Ger. After breakfast take a 6 hour drive to Khongoryn Els Sand Dunes. 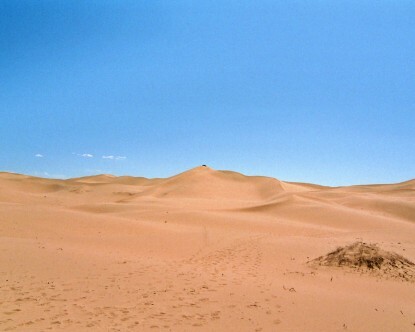 The longest accumulation of sand in the Gobi Saikhan National Park with the dunes rising to over 200 m in height and around 7 Km wide. The dunes are known by the locals as the “singing sands” as they make various sounds when the wind blows. Relax or try hiking or sliding in the dunes or even try Camel riding. Drive for 4 hours to Vulture Valley National Park and after a picnic take a one hour short trek through the stunning landscape known as the “Gobi Glacier” with its intriguing wildlife. Continue in the afternoon for 2 hours to Bayanzag, known as the Flaming Cliffs which extend for over 150 Km, explore the Gobi “Cemetery of Dinosaurs” and the trail of Roy Chapman Andrews who led the first exhibition to Mongolia back in 1922. Take a Camel riding session and explore the nomad's lifestyle before returning to the camp and taking in sunset. Wake up early morning to watch Gobi sunrise, after breakfast at the camp drive for 3 hours to Ongiin Khiid Monastery. Located on the bend of the Ongiin River, arrive early afternoon visit the monastery and take in the sunset from the top a nearby hill. A five hour drive on a sealed road to Ulaanbaatar, on the way have lunch in Ger camp close to the sand dunes. After breakfast see the opening ceremony of the Naadam Festival. See traditional performances and immerse yourself in the local culture. Spend a full day to explore the breathtaking shores of the stunning lake. Discover the local nomadic lifestyle with optional hiking trips and take great pictures along the shores of the lake which is home to a rich bird and wildlife. Discover the local Tsaatan people with an excursion to their village and take a 1 hour horse ride, before driving back to Murun in the afternoon. Free at leisure in Murun before flying back to Ulaanbaatar.